Are you are visual learner? 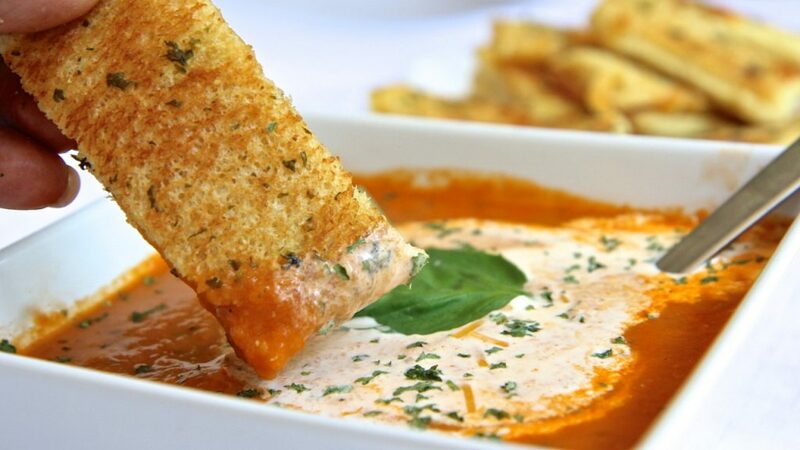 Check out my step by step video for this fresh roasted tomato soup & grilled cheese! As I’m typing this post the rain is really coming down here in NC. I LOVE days like this. It makes me wanna just cuddle up on the couch, read, bake, eat and repeat! My husband looooves tomato soup on rainy days! He’ll crack open a can and grab a sleeve of saltine crackers in a heartbeat. While eating a bowl of canned tomato soup I asked if he’d ever had homemade tomato soup made with, you know, real tomatoes and stuff. He replied “nope” and happily woofed down his mystery soup. Bless his heart. Since tomato soup isn’t really my thang I’d never even bothered to make it. I knew he’d loose his mind over a batch of REAL tomato soup so I was excited to “show him the light”. I didn’t even have to go to the store. Just simple, easy, fresh ingredients that I had in stock! The perfect way to use up fresh tomatoes! 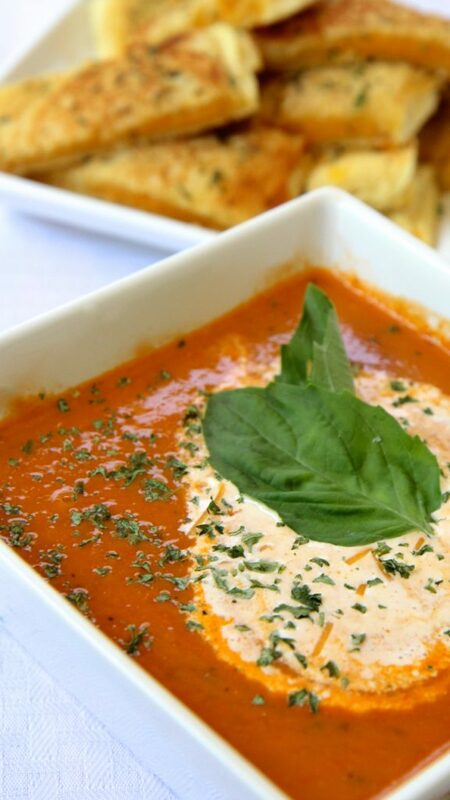 Nothing beats roasted tomatoes for tomato soup! That’s the only way to go for maximum flavor in my opinion. Let me just say this now…tomato soup is the BOMB!!! I can’t believe I’ve been ignoring this stuff for so long! Or maybe I should say fresh, roasted tomato soup is the bomb!!! I couldn’t stop eating this soup and the grilled cheese sticks just made it all a match made in heaven! Talk about bold flavor. I don’t remember it tasting this good when I was younger. I’ve made it twice already. And that splash of heavy cream at the end….. mercy! It’s so good and as with most tomato dishes, it’s even better the next day! Tomato soup certainly has a bit of elegance to it. Maybe it’s the simplicity and richness. Now you certainly can get all fancy on me and roast up some pepper, carrots, celery and thangs to add some ump! But I seriously prefer this soup simple with just that hint of sweet onion and roasted garlic and herbs. Delish! Brush a foil-line baking sheet with olive oil and set aside. Cut tomatoes in half and place cut side down on the prepared baking sheet. Place onions and whole garlic cloves on the baking sheet. Arrange everything in a single layer. Peel cooled garlic and place into the blender, followed by the tomatoes, onions, basil and oregano. Transfer mixture to a large deep skillet or pot. Stir in enough chicken broth just until your desired consistency is reached. Bring to a simmer and simmer gently until hot. You now have a GREAT base. Time to bring it to life! Add in smoked salt and black pepper a little at a time until well seasoned being sure to taste after each addition. Salt & pepper really brings out the flavor! Use white sugar to bring down the acidity and to lightly sweeten if needed. Feel free to add in garlic powder, onion powder or dried oregano and parsley for more flavor. 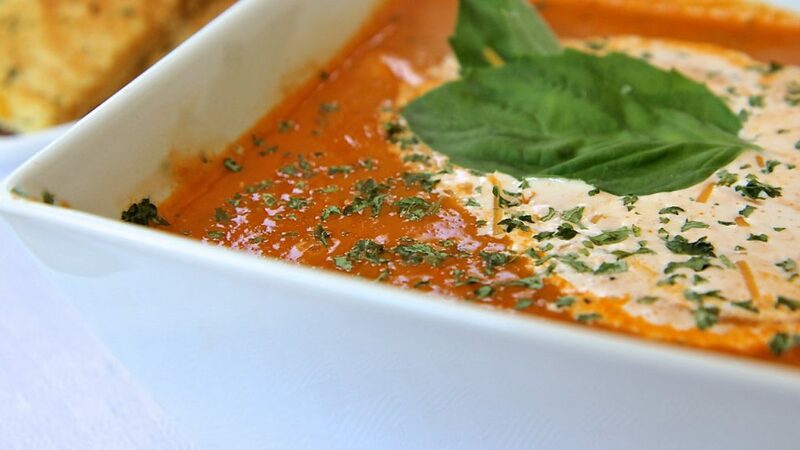 Ladle soup into bowls & garnish with fresh basil and a splash of heavy cream. To prepare the grilled cheese, heat griddle on medium heat. Mix together mayonnaise, garlic and enough parsley for a pop of color. Brush 4 slices of bread with the mayo mixture and place mayo side down on the griddle. When the underside of the sandwiches are golden, flip over and allow the other side to turn golden. When both sides are golden, remove from griddle and cut into 3 sticks. Serve alongside the tomato soup. Never liked tomato soup from a can but this recipe was delicious! Plus I had never used freshly grated smoked cheddar cheese and it was BOMB!!! I made this recipe last night and LOVED it! It is even better the next day. I made my grilled cheese with a gluten-free bread since I am not a wheat-eater, and dunking the bread in the soup was divinely comforting! A wonderful healthy comfort food. Thank you for this. I have planned to try your gluten-free carrot cake soon as well. Instead of the chicken broth for the tomato soup, can Vegan be used instead? Hi Jill. I think using a vegan alternative such as Vegetarian No Chicken Base by Better Than Bouillon or Not-Chick’n by Edward & Sons will work just fine. I’ve used them in the past in soups and they worked out great.